In winter I am even more of a homebody than the rest of the year and that’s saying something for this little couch dweller. One of my favourite things to do when the wind is howling and it is inevitably raining, is to cosy up under a snuggly blanket with a supply of Diet Coke and snacks to watch some of my ultimate favourite films, most of which my husband has shockingly not seen. I will admit that these predominantly date back to my late 90s early 00s teen years, but that’s how a favourite is formed. Obviously the best way to watch films like these is on a nice big TV screen (or at the cinema) with a bowl of popcorn and other snacks. If you’re thinking of upgrading your TV and making things more cinematic in time for winter, maybe have a look at the Oled Televisions from Panasonic. This is the best Shakespeare adaptation there is, I will brook no argument. It is also most people’s introduction to Heath Ledger, who gives an amazing energetic performance. It’s funny, a bit naughty, silly, passionate and just so entertaining. It’s also highly quotable. I have fond memories of the first time I watched this, and it’s tied very tightly to my teenage years. I have long classified this as a Christmas film – it starts on Christmas Eve and covers a year in the lives of a group of friends living in New York City’s Alphabet City, dealing with careers, relationships and AIDS. It’s also a musical. My husband hates it and makes me watch it alone. I have no idea why. I am a Rent Head and try to see it on stage regularly, which is tricky as it’s a bit of a cult hit in the UK and not many places seem willing to stage it. I bloody love it. I will sing along to every song, always cry at the saddest bit and can quote whole chunks of it. Oh, wait, maybe that’s his problem with it. I also wrote my MA dissertation to the soundtrack, thankfully none of the lyrics made their way onto the page, that would have been deeply confusing. No Day But Today! This is a super cheesy ballet movie – I think I must have watched it hundreds of times but I couldn’t tell you the names of most of the characters. There’s a lot of dancing, Zoe Saldana plays that stereotype ‘the sassy black friend’, Peter Gallagher (Seth’s dad in The O.C) plays the grumpy ballet company manager, Amanda Schull plays the heroine who’s “too fat” according to some of the dancers, and a lot of the other characters are played by actual ballet dancers. There’s lovely Charlie, who she should fall for and ‘Big Nose’ as we called him aged 15, the bad boy of ballet who breaks her heart but also makes her an amazing dancer. The soundtrack is cracking, and the finale is choreographed to Michael Jackson. It’s a total B movie but it has a special place in my heart. This is my official favourite film ever (Center Stage is my actual favourite) and it is the absolute sum of screwball comedies – Katherine Hepburn, Cary Grant, a leopard, witty crackling dialogue – who could ask for more? I don’t really think it has a plot, just lots of snappy talking and craziness involving big cats. I adore it. Plus Katherine Hepburn looks amazing in all her outfits. I was born in the 1980s, so films like this weren’t exactly on my radar when they first appeared. But when I was at uni I watched this classic teen movie and fell in love. The smart writing, the characters, everything about John Hughes movies makes me feel safe and happy. Despite the occasional struggle the characters always resolve everything by the end of the film and the soundtrack is always amazing. What are some of your favourite movies to curl up on the sofa and watch? Let me know in the comments. *This post contains sponsored or paid for content but all words and opinions are my own. My lovely local Hermes courier braved the freezing weather and snow to deliver my Illumicrate, bless her. This is a big box, so big it doesn’t have the usual logo on it – but it is packed full of books and bookish treats. The theme is Rise Up! and the items are all about rebellion. The book is Blood and Sand by C.V. Wyck – a female centred retelling of Spartacus, which really intrigues me as a premise. I look forward to reading this and sharing my thoughts later. There’s also an exclusive bookmark, pin and temporary tattoo. There’s also an ARC of Sally Green’s The Smoke Thieves. I read Half Bad and thought it was interesting so I’m curious about her new series, of which this is the first book. Now we have the box exclusives. 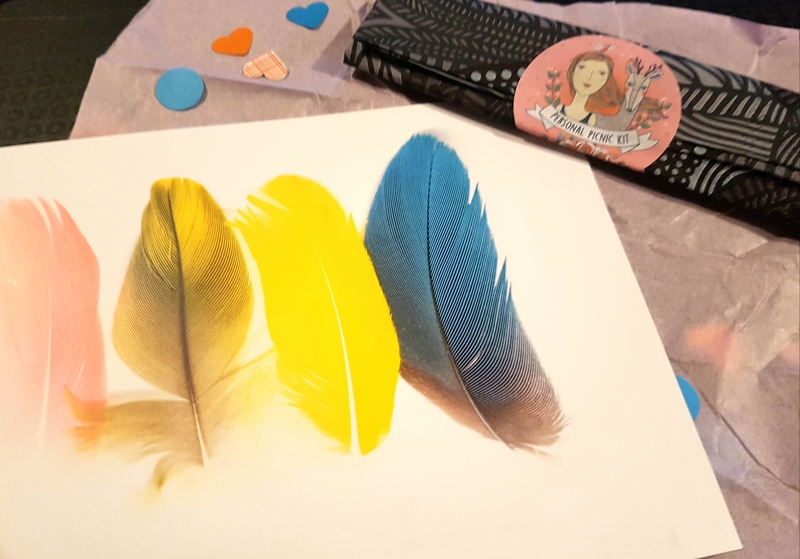 Fight the Darkness cushion cover by @stellabookishart – my copy of Ember in the Ashes is somewhere in my flat – until it turns up I will console myself with this bright and cheerful cover. A Rebel’s Command List by @howstoreofficial – handy for making my lists of what books to read next. Inimitable mug by @abbieimagine – I haven’t read the box this is inspired by but I like the design. Daggermark by @rdashjackdotcom – this is a nice quirky bookmark but too bulky for my preferred bookmark so I’ll add it to my collection. Yes, I collect bookmarks and have done for years (I have the Brownie badge to prove it 😁). Lunar Lip Balm by @lovely_lip_balm – a minty pot of lip balm, perfect for the current cold snap’s effect on my lips. Phoenix magnet by @hannahhitchmanart – as I’m not a Potter fan I’ll be passing this on but it’s nice and colourful. Bonus items are from Shatter Me, The Truth and Lies of Ella Black, Strange the Dreamer, Witchsign, Clean, The Hazel Wood – all either recently published or upcoming books. I think that this was a nice mix of items from different rebellion themed novels/fandoms. Nothing really leaped out at me this time. The books both look interesting but I might not have picked them up in a bookshop. A solid box but not the best one I’ve had so far. In my bedroom (I live in a small flat) there is the book mountain, more than an average to be read (tbr) pile. And it is slowly becoming impossible to manage. I’ve seen some interesting methods for getting through these piles, from putting a pound in a jar every time you finish a book (I’d be broke in a week) to going on a book buying ban (never going to happen fyi there are just too many good books out there and the local library reduced its books after a refurb- a rant for another time). So when a Twitter friend introduced me to the #tacklestack challenge I was intrigued. Created by a book blogger to get through her own mountain, there are several different options. I chose the read 5 books one. Mini reviews of each book will be posted on Instagram when I finish a stack. Some of these books have been kicking around for a while – I mean in some cases I moved in with them 6 years ago and still haven’t read them. 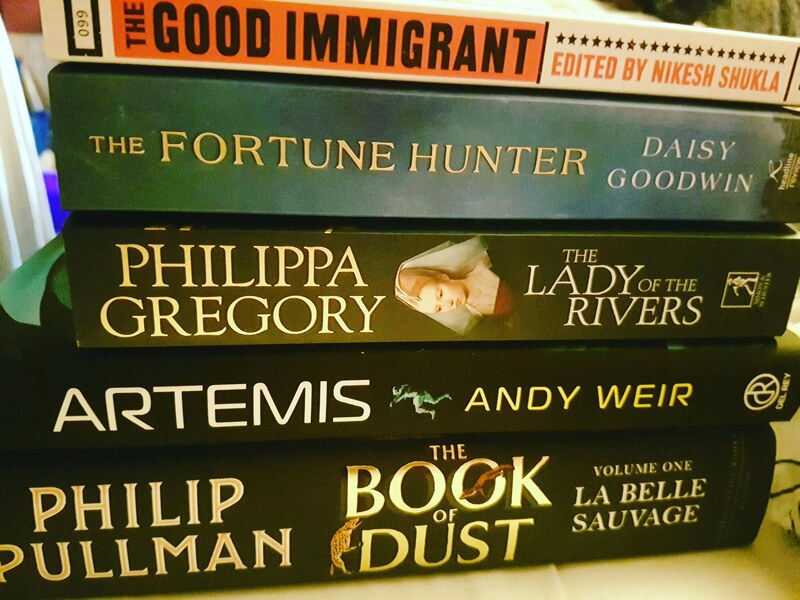 Of course, being me, I had to complicate things – I am also dipping in and out of Tales of the Marvellous and News of the Strange, an English translation of some ancient Arabic fables that pre-date A Thousand and One Nights, and reading ARCs for review and some upcoming blog tours. I also have a stack of magazines to read and the weekend papers get delivered so I’m not completely out of the loop on world events (Twitter keeps me reasonably well informed five days a week). My dad passed over his Amazon Fire tablet as he’s got a new iPad (that man does love a gadget) so I can read some ebooks to review (although I’m still not a fan) and download some French books to continue that plan too (it’s embarrassing to have a French name and family but be so bad at it). After I cut that damn mountain down to size I’m planning a Terry Pratchett re-read from the beginning (if you get the Thameslink between Mill Hill and Blackfriars I’ll be the woman crying with laughter into her scarf twice a day). Anyone else tackling the stack? Wanna share your current reads? Comment here or find me on social media (I’m always ramblingmads) and chat books. 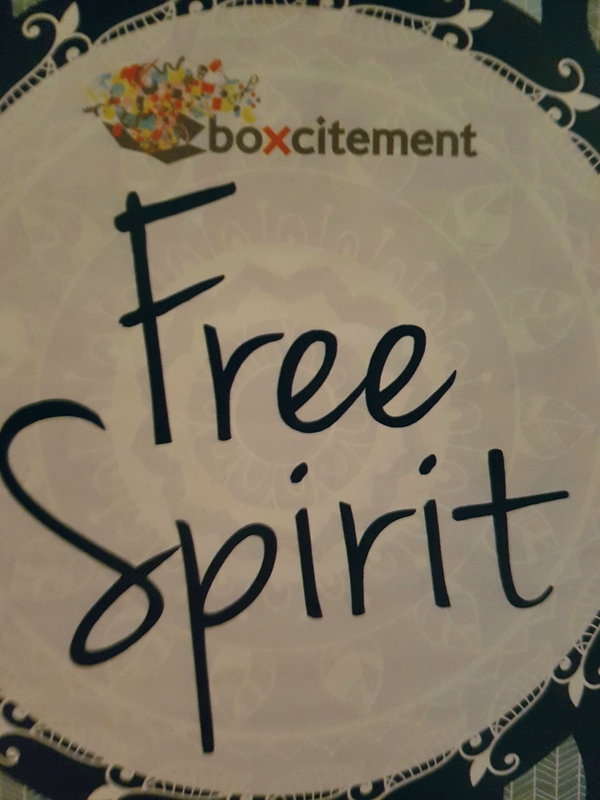 Boxcitement’s Free Spirit box is a delight. Full of bright colours and fun shapes. Inside the box was all these goodies. A wall mountable mini mirror – yay! I really like this, unpacking it made me smile. This cute charm bangle – it makes a nice jingle when I walk. Raindrop planner clips, these are the cutest things, which I will use to keep various post-its together. Personal picnic kit – recyclable cutlery and a cute napkin. 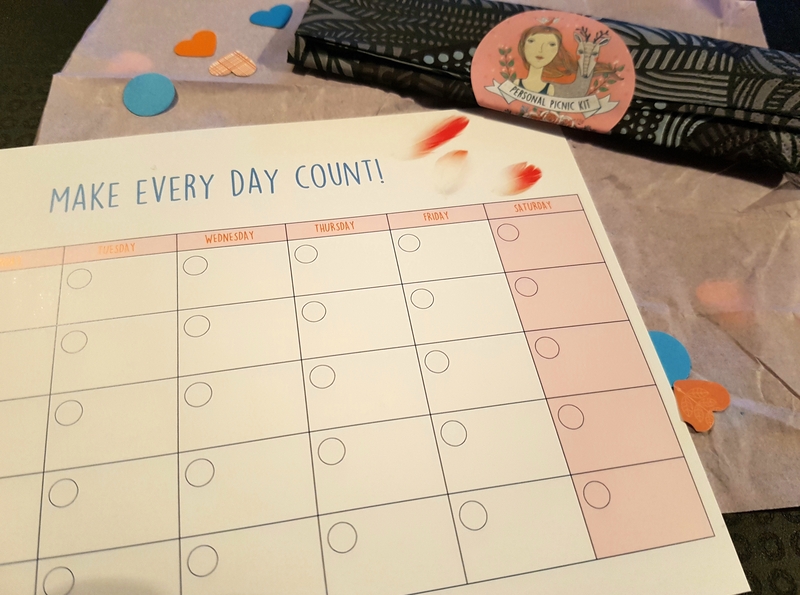 Art print that is also a planner calendar. Memory notepads – to jot those ideas down! 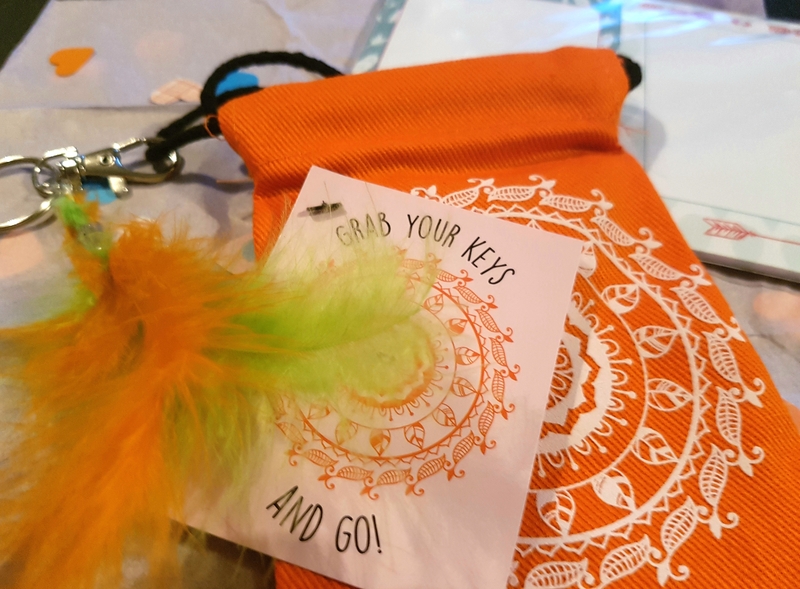 Teeny backpack pouch and feather keyring. Overall I really like this box – especially the mirror and bracelet, less so the single use (but thankfully recyclable) picnic kit. The stationery items are right up my street – paperclips and notepads yes please! 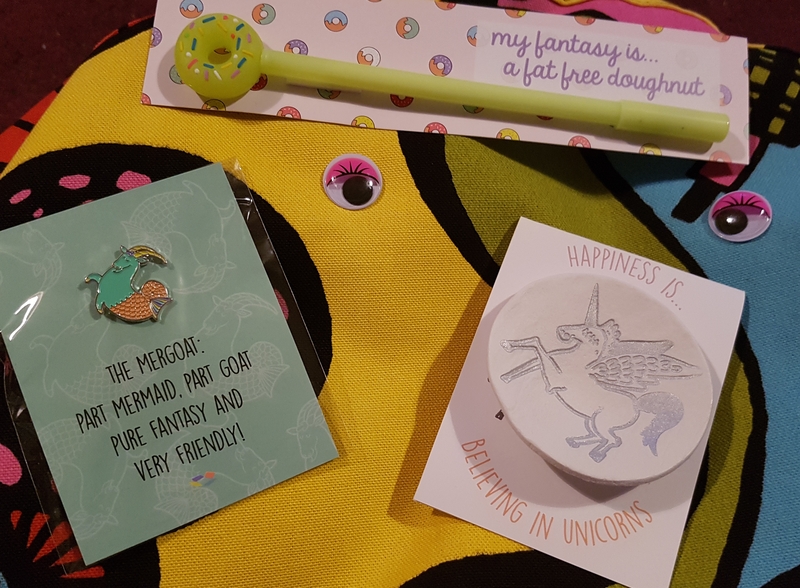 Next week is my birthday and while I generally don’t go mad for present requests, when Uncommon Goods got in touch and asked if I’d like to make a wishlist from their incredible range of gifts, I said yes. Uncommon Goods was founded in New York by Dave Bolotsky, inspired by the collections of the Smithsonian Museum, he wanted to curate a place for independent artists to sell their handmade, unique pieces. The company focuses on sustainability, and work in an ethical way, giving back to non-profits with every purchase through their Better to Give program. 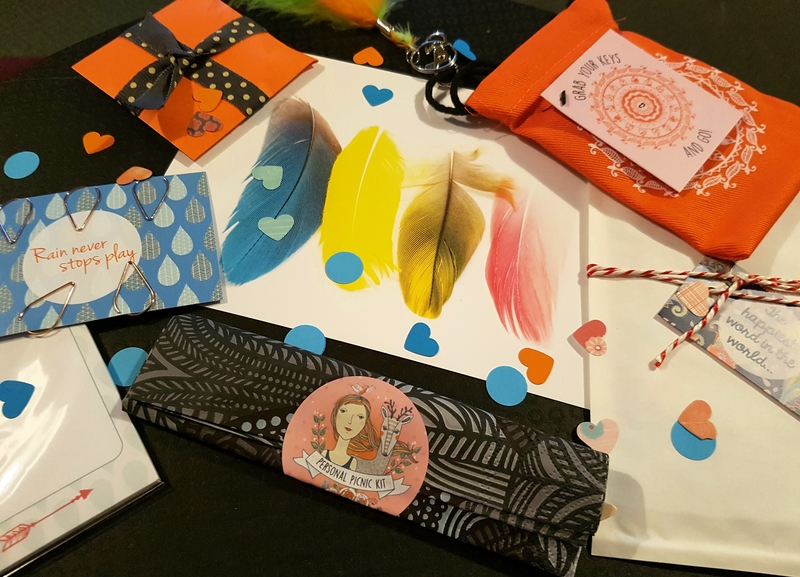 I love working with companies like this, I strongly support independent businesses and artisans and this is a great way to discover some amazing artists and their creations that you might otherwise miss in all the noise of the internet. Dare I mention it, but the C-word (the nice one) is just around the corner but don’t worry, the gang at Uncommon Goods have got you. With everything from curated lists of gifts for your best friend to the hard to buy for teens there’s something for everyone. I will certainly be buying some of these beautiful things for my friends and family. How cute is this guy? And he’s called Elwood, which makes me think of The Blues Brothers. One of my favourite films. So I need my hot chocolate in my Elwood the unicorn mug, feet up watching Elwood & Jake Blues please! I’m a massive book fan and a literary scarf would be fantastic, maybe not Jane Austen though as I’m not a fan, but I do love an infinity scarf. I like the idea of wearing a book around your neck. Perfect for when I get bored on the Tube and I’ve finished my book. I am always losing my glasses so this chap would be really handy and turn my wandering specs into a piece of art at the same time. I love the big nose, mine’s not quite as chunky, I hope! Food is a big part of my life but sometimes I find it hard to get into cooking dinner every day, these foodie dice might just put the fun back into meal times. Certainly might get me experimenting with new combinations. 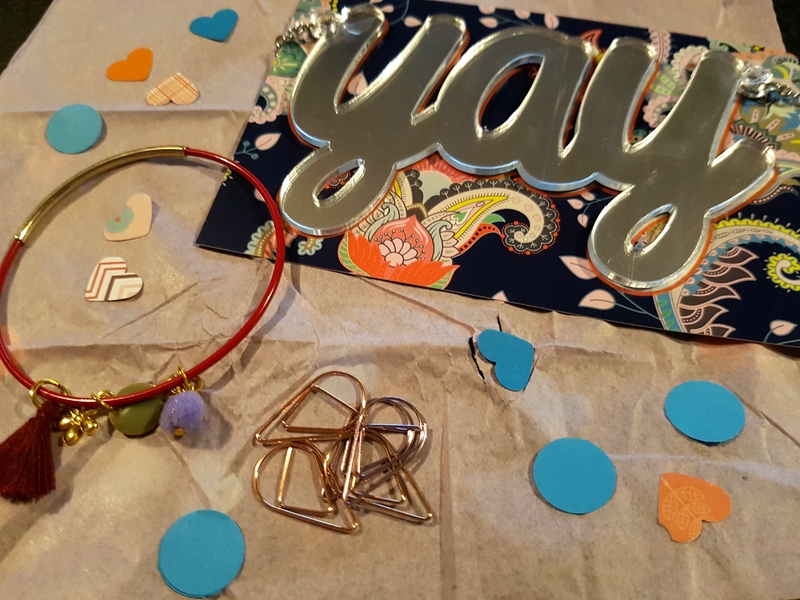 I love pretty jewellery and I can always use some positivity, attracting good vibes is definitely a bonus. I also like the pairing of gold and silver charms, it’ll go with any outfit. Finally, this beautiful and fun indoor herb garden would go really nicely in my kitchen and because of the clever hydroponic system I might even manage to keep these plants alive. *while this is a sponsored post, all opinions are my own. 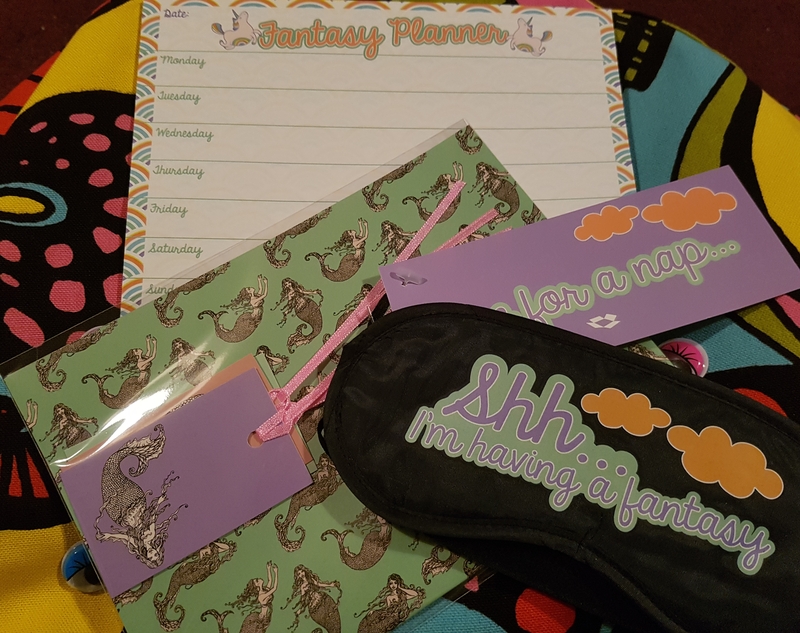 I treated myself to a little bit of fun this month with this box from Boxcitement. 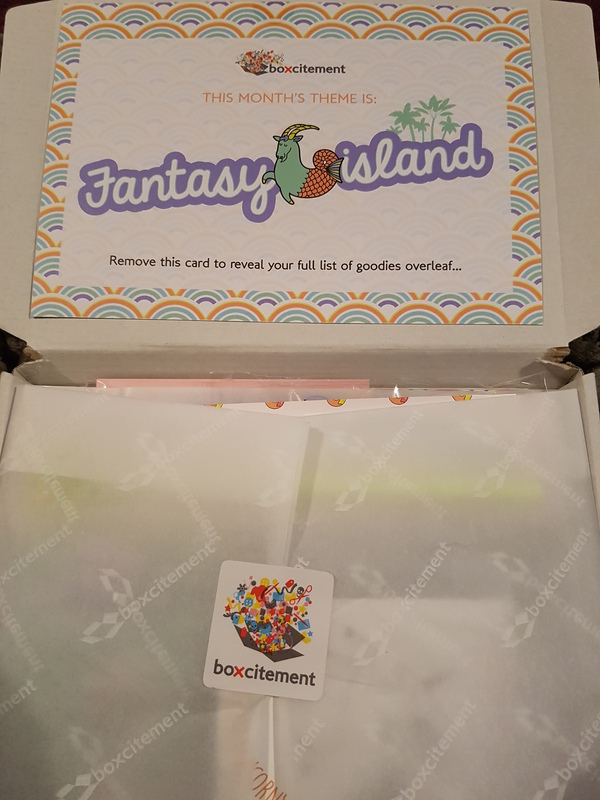 Inside the Fantasy Island themed box are a collection of items to celebrate dreams, fantasies and wishes. 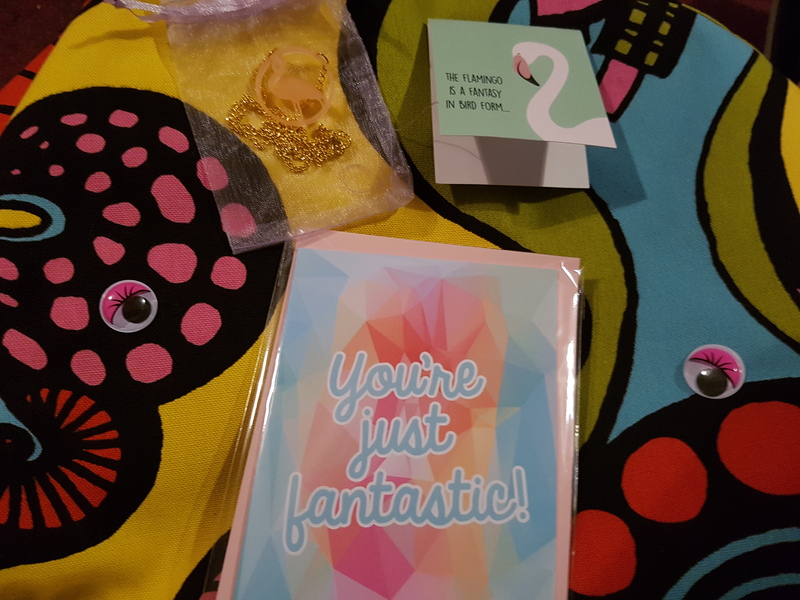 This box is fun, whimsical and brightly coloured. I really enjoyed opening it all up and seeing all the bits inside.